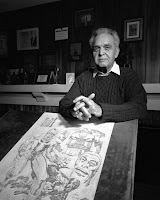 More on the Marvel vs Jack Kirby's estate court case. During Mark Evanier's deposition, he made this statement, when asked if he'd referred to any research material or reference books to substantiate his claims about Jack Kirby, Stan Lee and Marvel Comics during the time period in question (1958-1961). MARK EVANIER: I don't know of any reference book or source like you're describing that would do that. I derived a lot of my knowledge about Marvel from books, as I mentioned. Gene Colan - A Call To Arms! By now everyone associated with comic books should be aware of Gene Colan's health situation. Simply put the man isn't well, but when you look at it, he's not been all that well for a while now. Late last week Gene woke up with chest pains and shortness of breath, so his son took him straight to the hospital where he was admitted. He's now in a serious, but relatively stable condition, but the outlook could be better. A hell of a lot better. Gene has had a rough trot in the past few years. First was his much publicized health issues, then there was the scandalous issue which we all know about. Then, sadly, his beloved wife, Adrienne, passed away. All of this adds up to a series of blows that would have seen a lesser man simply give up and wait for the inevitable. But not Gene, no, not by a long shot. Gene isn't going anywhere.